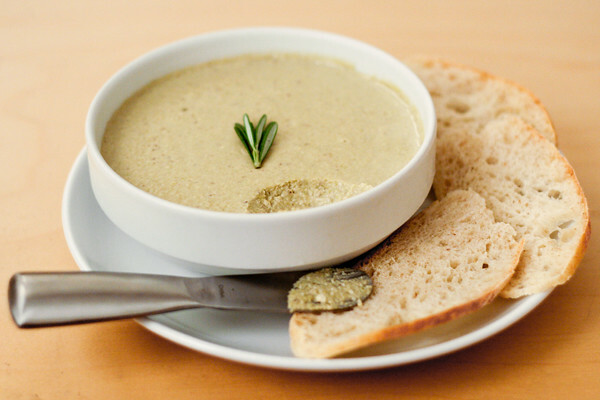 top with thickened milk and garnish with dill. serve. Problem : Baltimore might as well be on Mercury. It's supposed to feel like 107 today and right now I'm considering that a dangerously low estimate. It's terribly hot out there! 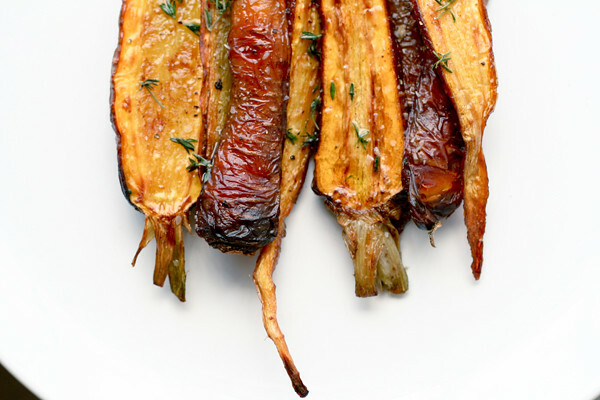 Solution : Lure in the cooler autumn weather by preparing classic fall foods, like these carrots. You have to believe that this will work. You just have to. For me. Preheat oven to 375F. In an ovenproof pan, heat the olive oil over medium heat and add the carrots. 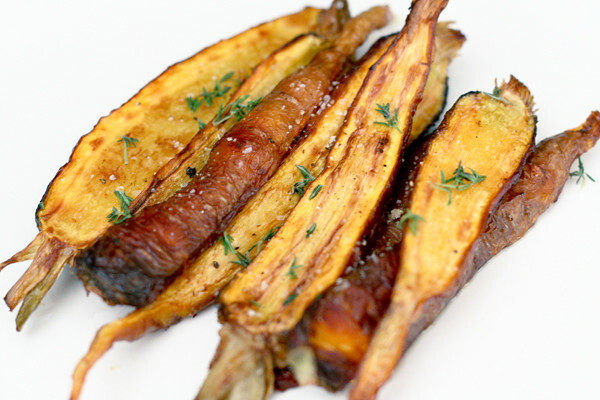 Sprinkle the carrots lightly with salt and cook for two minutes. Toss in the olive oil a few times and then place the pan in the oven. Roast for 20 minutes. Turn carrots once and cook for 5 more minutes. Remove from oven, season with salt and pepper. Garnish with a little thyme. Eat while imagining yourself raking leaves, carving pumpkins, and drinking cider. Feel cooler, yet? It's been about a month since I last wandered through this small slice of the internet, but I promise it is not because I've been lazy. Since my last post, I've attended two amazing weddings. The first wedding saw me as a one of several photographers and I am just now finishing up going through the bazillion photos I captured. The second wedding also provided an exciting challenge: Sometimes was the caterer. We've never catered anything before and were incredibly humbled and excited to be asked to cater. It was a blast cooking all of the food and I hope everyone enjoyed it as much as we did. But now that the dust has all settled, it's time to give Six Course Dinner my undivided attention for a bit. It feels good to back on my home turf. So good, that I didn't even mind running the oven this afternoon. And since I've been doing a bit of baking lately, I figured why not incorporate that into today's post. So preheat that oven: we've got a stuffed braided loaf to make. Prep pizza dough and allow to come up to temperature if it has been sitting in your refrigerator. Preheat oven to 400F. In a saute pan, heat olive oil over medium heat. Add squash and the poblanos and cook until just tender. Season with salt, pepper and dill. Set aside to cool for 10 minutes. Stretch or roll your dough until it is about 18"x9" on a floured sheep pan. Make two parallel marks running down the center, about three inches apart. On the outside of each mark, slice the dough into 1/2 inch strips. 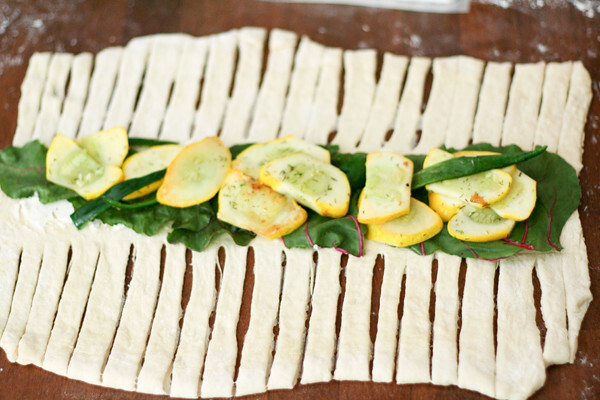 Spread a layer of goat cheese between the two marks and top with Swiss chard, and half of the squash and poblanos. Repeat with another layer. 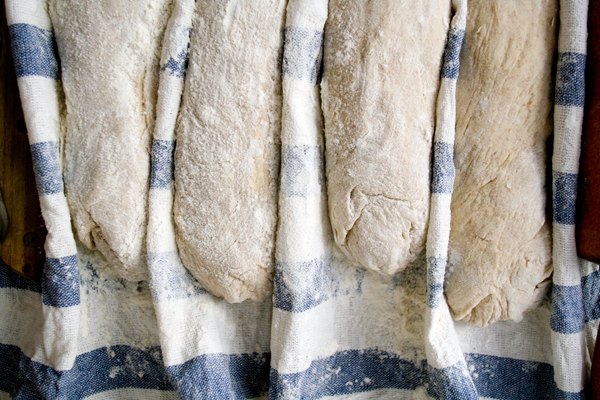 Starting at one end, begin to "braid" each of the dough strips one over the other all the way down the loaf. You'll probably be able to figure it out very easily. Pinch the ends together when you get to the end of the loaf. Brush the top of the loaf with a little olive oil and bake for 35 min. Allow to fully cool before slicing and serving. 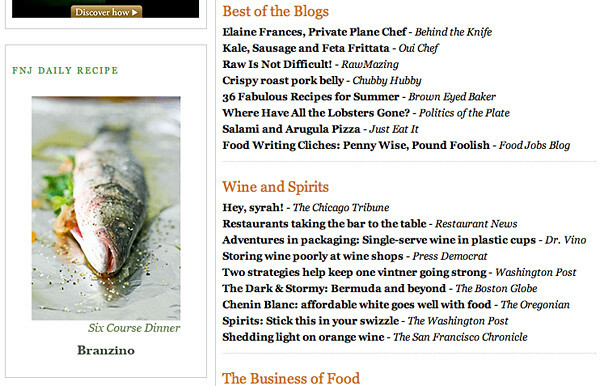 This morning I was excited to see that my branzino recipe has been featured as the daily recipe over at Food News Journal, an exceptionally informative blog that is quickly becoming an invaluable resource for me on all things food. There you'll find daily recipes from different food blogs, news and opinion pieces from all over the web, as well as links to different food events all over the country. The article on a Vancouver restaurant with a 'pay what you feel the food is worth' policy was extremely interesting. Anyway, if you've not yet seen Food News Journal, why not head over there and check it out! It's all the food news that's fit to report. Summer is nearly upon us in Baltimore. And as always, I have mixed feelings about this season. I definitely enjoy having lots of green trees around, and all of those amazing vegetables at the peak of their flavor, and how could I forget the fireworks! But the main thing I don't like is the weather. Baltimore gets so hot and humid that our trademark rowhouses turn into giant brick ovens roasting under the hot sun all day. All of these things bring me to one sad conclusion: it's too bloody hot to cook. This summer I've decided to spend less time in front of a hot oven while spending my normal amount of time cooking. Some oven and stove work is unavoidable, but I'm going to try to keep it to a minimum. It just makes sense, doesn't it? 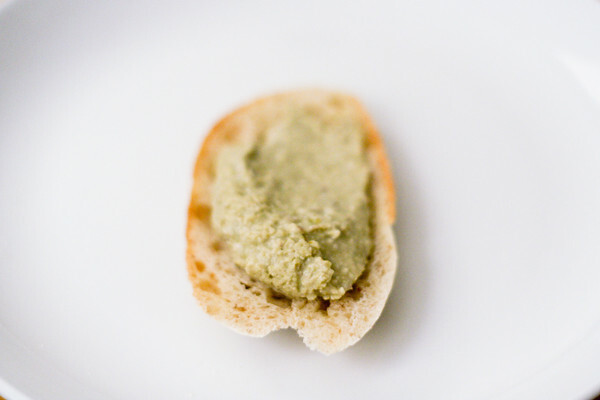 So first out of the gate, we're whipping up this split pea paté. I realize this calls for roughly 30 minutes of boiling, but you can cook it earlier in the day before the sun rises too high as it needs a few hours in the fridge to get to the right consistency. Then, it's cool food all the way. Summer: 0. Me: 1. Bring the water to a boil, adding a little salt as well as 1 oz. of the Valdeón. When it is boiling, add the sprig of rosemary, the shallot, and the split peas. Cook for 30-40 minutes until the split peas are nice and tender. Drain off the peas and place them in a food processor, adding the remaining Valdeón, the walnuts, and the butter if desired. Process until nice and smooth. Check for seasoning and add salt and pepper to taste. Pour into a nice bowl and allow to cool. When at room temperature, cover with plastic wrap and move to the fridge for at least two hours to set up. Serve cool with some nice slices of toasted bread. Since the farmer's market in downtown Baltimore is now back in full swing, I get to indulge myself in one of their best offerings: fresh fish. Don't get me wrong, the 32nd Street Farmer's Market is still one of my favorite places in the world; they just don't have fresh fish. The proud people behind Salt River Lobster are available downtown every Sunday with many fresh catches. This morning I had my heart (and stomach) set on getting a whole fish. As usual, I was not disappointed. Some lovely whole branzino were available and after a few other purchases, I was heading home to keep this bad boy on ice. All that was left to do was toss together some onion, raisins, and oregano for a stuffing and get that sucker in the oven. Preheat oven to 400F. Peel the onion and grate on a box grater. In a saucepan, heat the butter over a medium heat. Add the grated onion and the raisins plus a pinch of salt. Cook, stirring occasionally, until starting to brown. Add red wine vinegar and cook until the onions and raisins have absorbed all of the moisture. Set aside. Rinse the fish out and pat dry with some paper towels. Season the inside and outside of the fish liberally with salt and pepper. Carefully stuff the inside with the onion/raisin mixture as well as the sprigs of oregano. 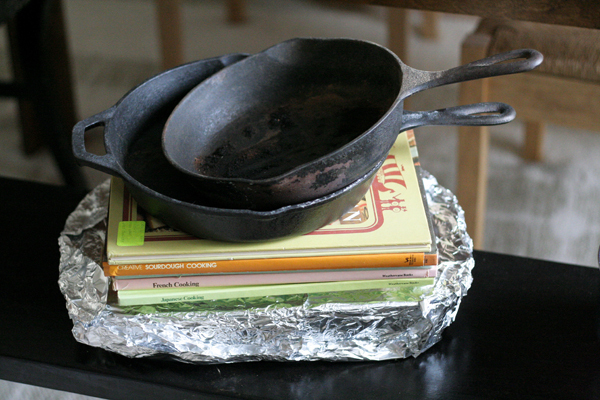 Grease a roasting pan with the olive oil (in my case, I used a couple of sheets of aluminum foil to form a make-shift pan). Place the fish in the pan, tossing it over a few times to coat the entire surface with the oil. Roast for 20 minutes and then move to the broiler for an additional 3-5 minutes to aid in browning. Keep a close eye on the fish when it is under the broiler. If the tail starts to get too brown, cover it with some aluminum foil. 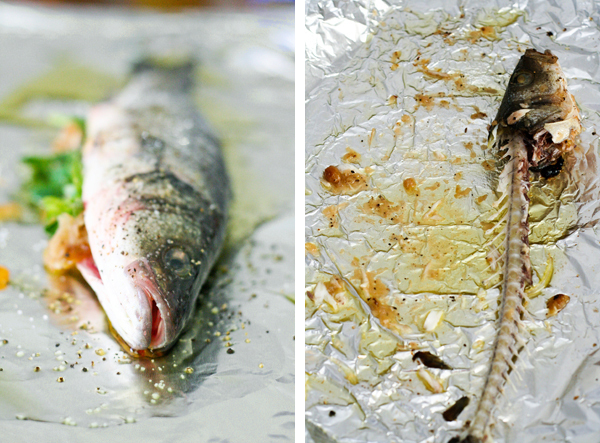 Remove the fish from the broiler and careful carve off portions. 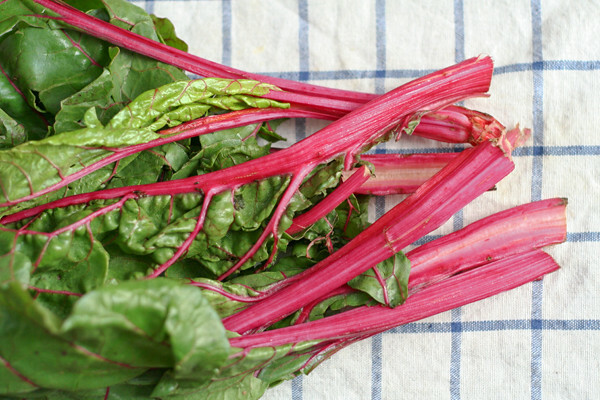 Serve with some of the stuffing, some flageolet beans, and maybe some bull's blood beet greens. Garnish with a little oregano. And don't forget to save those bones for stock! Well that is slightly embarrassing. 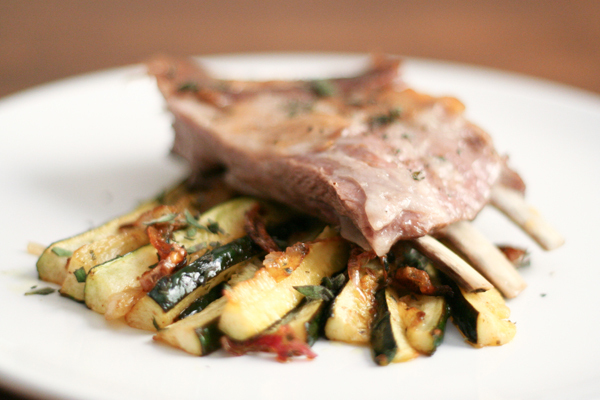 I completely forgot to post the recipe I use for the zucchini and shallots that I included with the breast of lamb recipe. Oops. I thought I would make good and post it now. 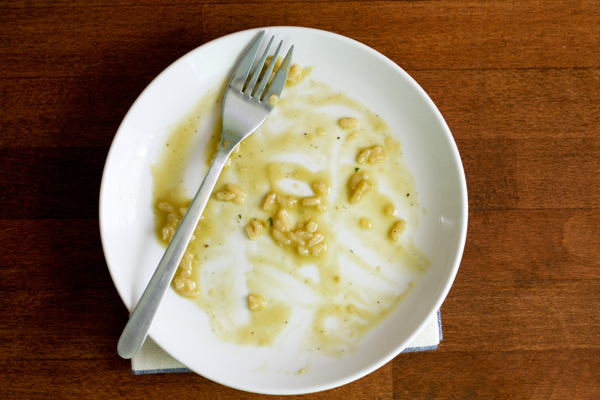 It is a really simple dish that could easily stand alone as well. Normally when I cook, I reduce the amount of butter by at least half at any given time. However, this is one of those dishes where a nice large knob of butter really is a good idea. You could use olive oil if you want, and that would be good. But if you want great: there really is no substitute for butter. Preheat oven to 400F. In a large oven proof skillet, heat butter over medium heat until it starts to smell a little nutty and has gone a shade or two darker. When the butter is ready, add the shallots and a light sprinkle of salt. Cook for about a minute until the shallots are translucent. 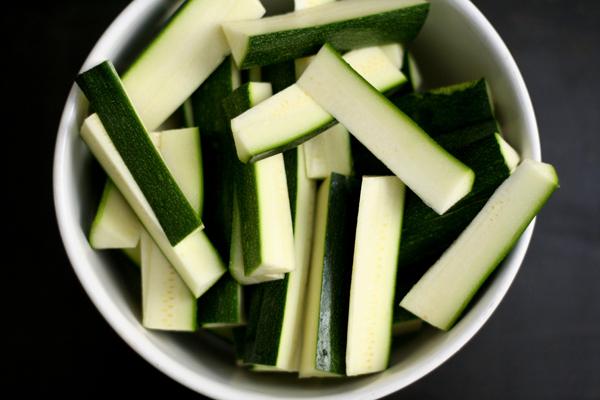 Add the zucchini and toss to coat in the butter. Cook for a few minutes until the zucchini are just starting to show some color. 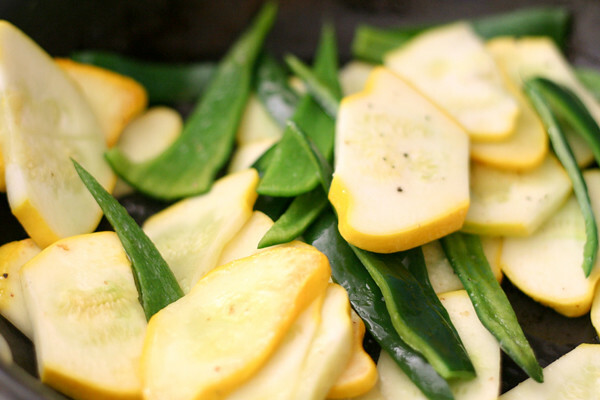 Squeeze the lemon juice over the entire dish and place the skillet in the oven for 8 - 10 minutes until the zucchini are pleasantly soft and have a little golden color. Season with salt and pepper and garnish with some fresh dill. Serve hot. Lamb is one of my favorite animal proteins. It is incredibly delicious, tender, and unfortunately: expensive. So I was excited to learn more about lamb breast. Similar to spare ribs, lamb breast is a cut that may not offer very much meat but does offer a great flavor for very little money. Why? Because if you want that melting tenderness you have to cook the sucker for two and a half hours! Good thing I am patient. Preheat oven to 325F. Remove excess fat from lamb breast and discard. Liberally rub both sides of the lamb breast with salt, pepper, and marjoram. In a large pan or griddle, heat the olive oil over medium heat. Brown the lamb in the oil and move to an oven safe casserole. Pour the cider (preferably homemade) over the lamb and add some thinly sliced onion. 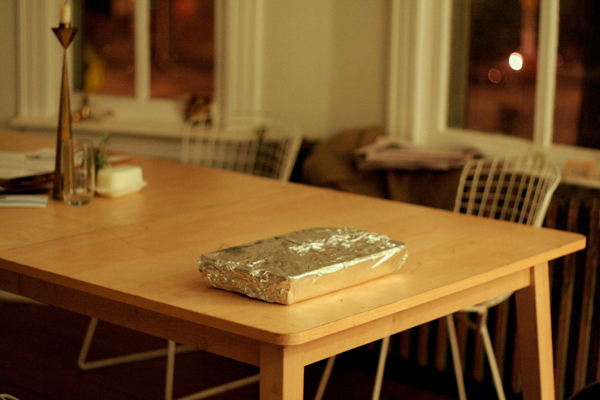 Cover and tightly seal with aluminum foil and move to oven. Braise the lamb for two and a half hours of until the rib bones easily slide out of the meat. 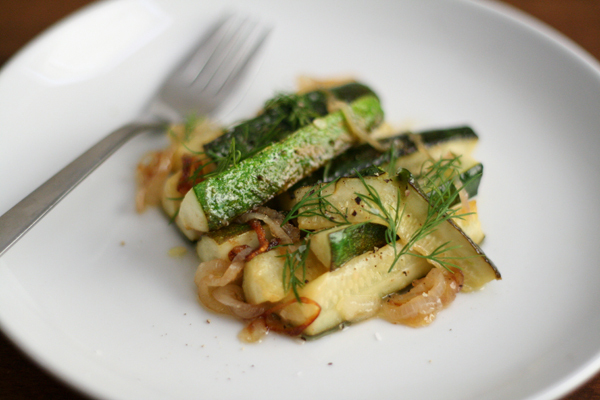 Serve with zucchini and shallots. I may have mentioned this here before, but I tend to largely ignore lunch foods. Not that I don't eat lunch; I do everyday. Its just that I never really consider it a meal that is really worth worrying about. I am much more interested in cooking for dinner (surprised?) and even brunch than I am for my midday meal. I'd rather just grab some left overs and maybe a yogurt and call it over. 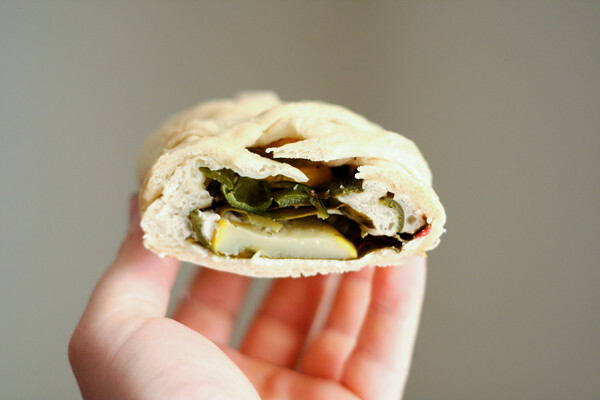 But recently I have been trying to get back to being more satisfied with my lunches. The yogurt remains, but I've decided to start from scratch on everything else. 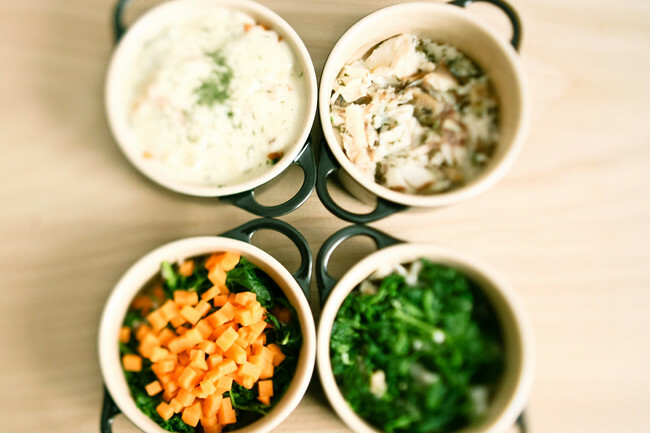 Ideally a great lunch is compromised of any combination of soup, salad, or sandwich. Today I'm focusing on the sandwich part. In fact I've got two sandwiches to offer. And as I am trying to learn more about bread baking, I've gone to great lengths to research what bread would suit me the best. I think I might actually have found it. It takes about three days to make, although it is not really that complicated. Normally I'd share this find, but right now I'm going to be a little selfish and keep it all for myself. I'm still tweaking it a bit and want it to be perfect before I toss it up on here. Anyway, the two sandwiches really don't require recipes. It is just rather important to use ingredients that will hold up to the quality of the bread. 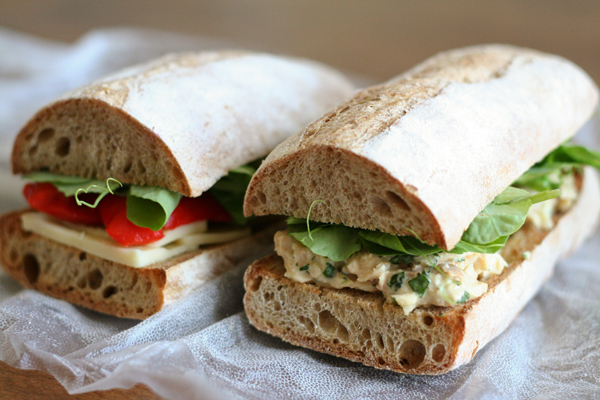 For one sandwich I've gone with some excellent tuna which I lightly dressed in homemade tarragon garlic aioli. 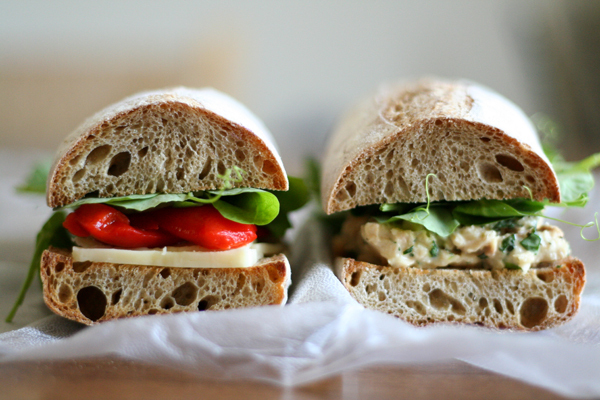 And the other sandwich cradles some roasted red peppers and horseradish cheddar. Both are topped with sweet pea vines before being devoured. I love dirty vegetables. While many people would think that a dirty vegetable simply has not been washed thoroughly, I tend to see the dirt as a certain degree of pedigree: a symbol that that vegetable has just been removed from the ground and is at it's very freshest. And these particular leeks were at their best. Pulled from a local garden only a matter of hours before I was lucky enough to receive them as a gift, these baby leeks needed only a quick rinse before I put them to work. 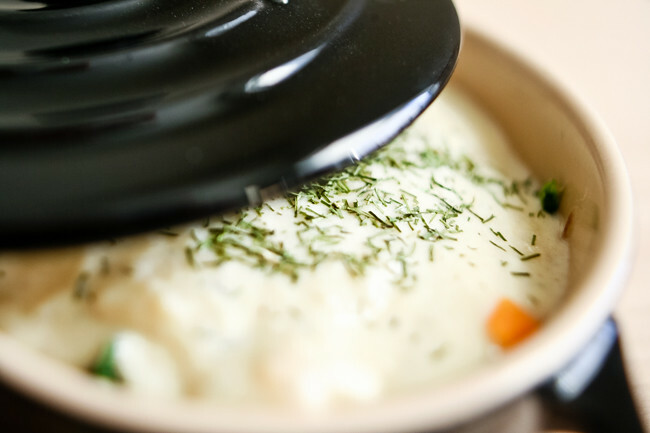 In a large sauce pan, slowly bring the stock to a strong simmer. 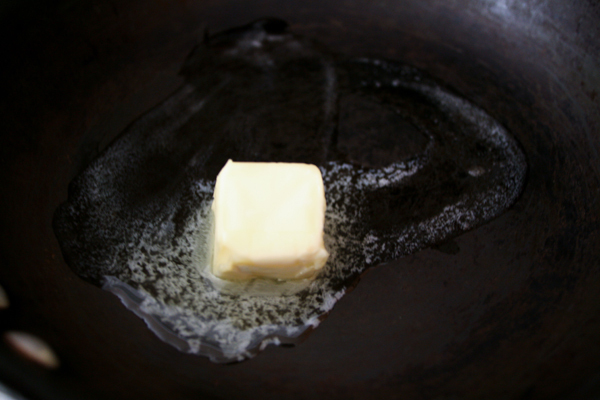 Meanwhile, heat 2 tbsp butter in a large saute pan over medium heat. Chop the whites of the leeks, discarding the tough greens. Lightly saute the leeks in the butter until just cooked. 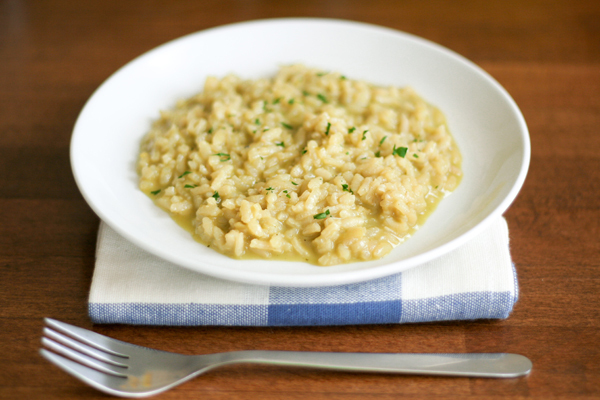 Add the arborio rice, gently tossing frequently to coat each grain in a little butter. Cook until translucent. Add a ladleful of simmering stock to the rice, stirring to combine. Keeping adding only one ladleful of stock to the rice only after the rice has absorbed all of the previous ladles worth of stock. Stir each time to add the stock and occasionally as needed. Between ladlefuls, place parsley, garlic, mustard, olive oil, lemon juice, and 1/4 cup stock in a food processor. Process until very smooth and strain through a fine mesh strainer to remove any left over solids. Season with salt and pepper and reserve. 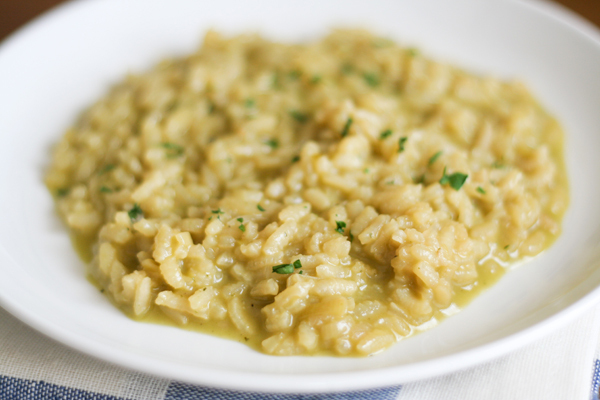 When the risotto is almost finished, stir in the remaining butter and remove from the heat. Season with salt and pepper to taste and stir in the mustard parsley coulis. Serve warm with a little parsley as a garnish. 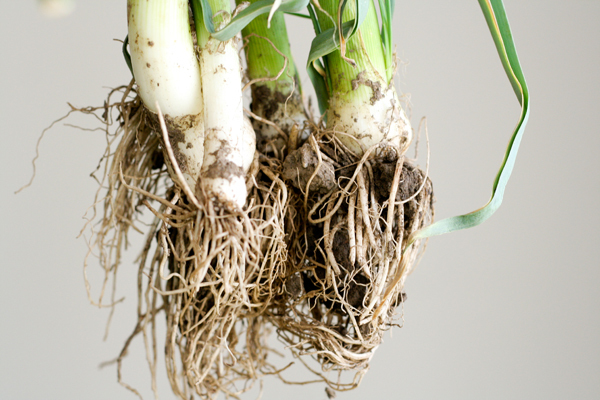 Thanks again for the leeks, Angie! Winter is rapidly winding down to a close. (We get to change our clocks this weekend!) And, as with every year, I find myself both welcoming the warmer weather and fresh vegetables as much as I dread saying goodbye to all the warming comfort foods of winter. So this year, instead of putting those comfort foods away until the temperatures take a nose dive again, I've decided to adapt some of them for year-round enjoyment. With so many winter staples to choose from, it is hard to know where to start, but the humble baked potato seems like a good idea. 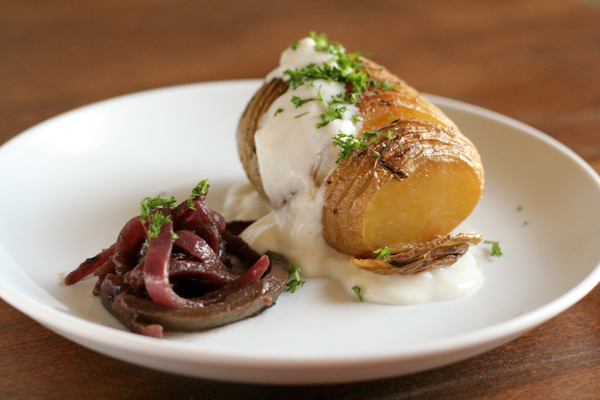 Instead of just tossing Idaho's best into an oven before smothering it with sour cream and chives, here we have finely (almost) sliced Yukon Gold potatos, roasted garlic goats milk yogurt, and some tangy-sweet red onion and jalapeno confit. Shredded cheddar and crumble bacon need not apply. Preheat oven to 400F. While the oven is heating up, carefully slice potatoes every 1/8th of an inch, only going about 3/4 of the way down. (Two dowels on either side of the potato will help you cut to the right depth without going through). 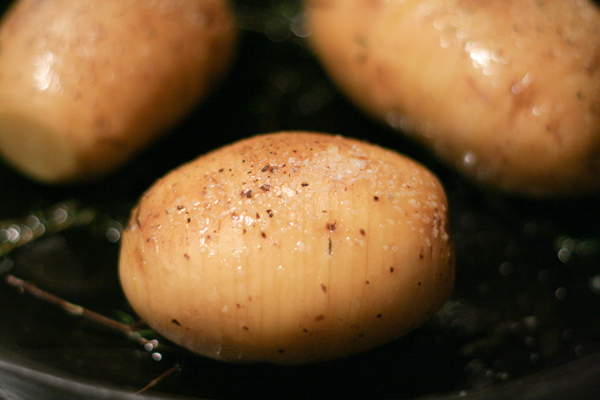 Place the potatoes in salted water until ready to roast. In a cast iron skillet, heat 3 tbsp of olive oil over low heat with several sprigs of thyme. 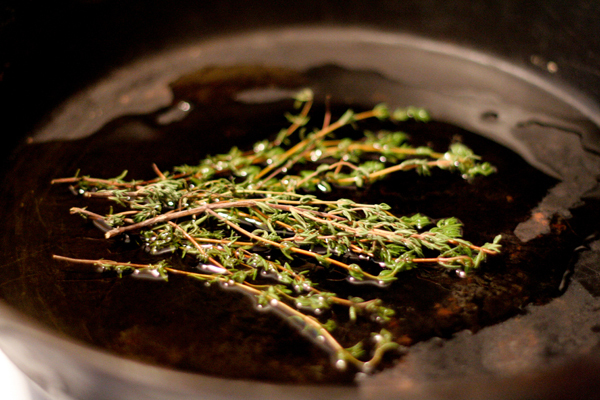 When the oil takes on the flavor of the thyme, remove the herbs from the skillet. Drain the potatoes well, and coat the potatoes in the oil thoroughly. Sprinkle with a little salt and pepper and move cast iron pan to the oven. 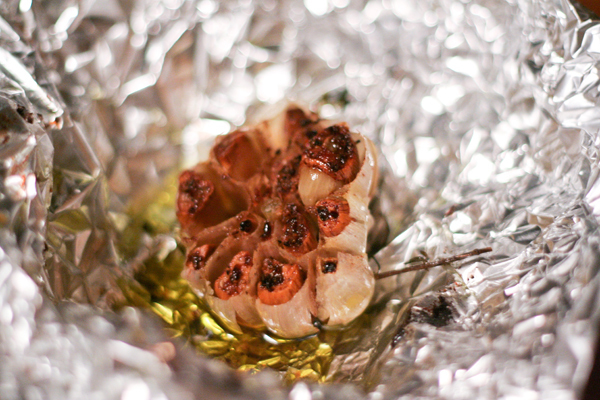 Also, slice the top third off of a head of garlic, removing excess papery skin, drizzle with olive oil and wrap in aluminum foil. Place in the oven alongside the cast iron pan. Roast both for about 40 minutes or until tender. 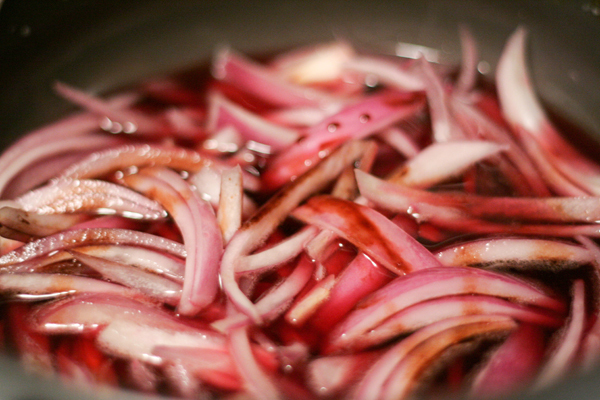 Meanwhile, slice the red onion lengthwise into thin slivers. Heat butter in a saucepan over medium heat. Saute onions, but do not let them turn brown. Add the pomegranate juice, sliced jalapeno, and balsamic reduction (that you made yourself, right?) and lower the heat to a slow simmer. Gently simmer until almost all the juice is absorbed and the onions are very tender. Season with salt and pepper and reserve. Remove the potatoes and garlic from the oven when they are done. Carefully remove the garlic from the aluminum foil and allow to cool for a minute before squeezing the now soft cloves into a bowl. Gently mash with a fork and stir in the goats milk yogurt. Season with salt and pepper to taste. Spoon over potatoes. Serve with the confit and garnish with parsley. Happy 2nd Birthday, 6CD. You're growing up too fast. So fast in fact, that I didn't even have time to make something special. But I guess you're not supposed to cook your own birthday meal, are you? Regardless, here is something special from a few days ago (from Sometimes). Take a ring mold and punch out a cylinder from each potato. Next take a slightly smaller ring mold and cut down into the center of the ring mold about half an inch or so. Remove the ring mold and carefully scoop out the now cut potato to form a cavity. Hold in a salted water bath as you bring the stock up to a boil. Steam the potato over the stock until just tender. 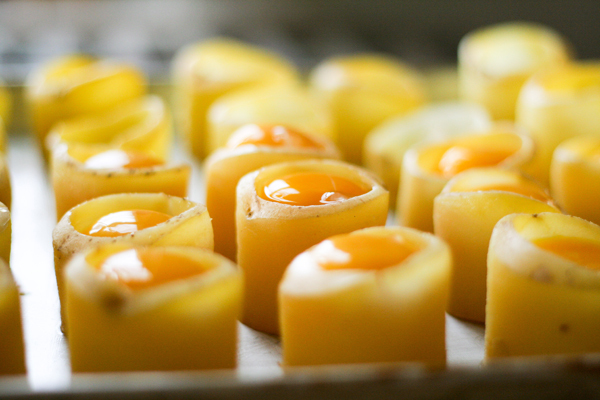 Place a small knob of butter in each cavity and follow with a single egg yolk. Cover with foil and bake until gently warmed through, but make sure the yolk is still nice an runny. Top with a light coating of cilantro pesto. 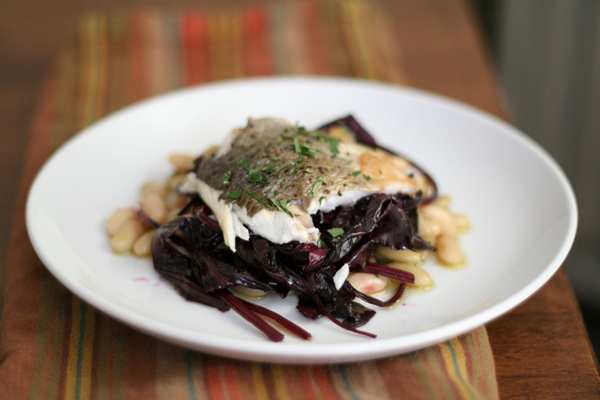 Serve with a finely chopped fennel salad. I'm definitely not one to showoff, but I was excited to see this yesterday. 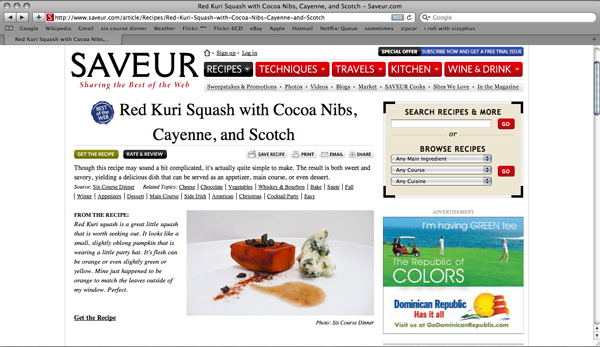 I'm not sure how long it has been up, but Saveur Magazine's website features a recipe from this little blog on their "Best of the Web" section. Very cool! You can check it out here if you like. So I have this strange desire sometimes to eat foods from cuisines that are somehow connected to my current surrounding climate. Its sort of like a little mind/tastebud/stomach vacation that I get to take when the weather changes. Right now those surroundings are covered by a ridiculous amount of snow so in my head I am somewhere very cold. And since we are supposed to get even more snow tonight, I've bumped that mental location even further north. So in that bizarre spirit, I decided to make a Russian Salad. 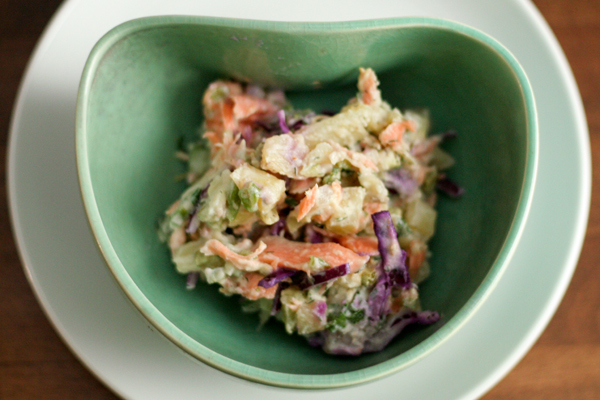 The Russian Salad is quite similar to your average potato salad, but it also sometimes contains a little meat. But despite the cold weather, constant shoveling, and walking to work I still really don't need to be eating a ton of mayonnaise. Mayo: exit stage right because your replacement has arrived. Enter creamy, thick Greek yogurt. The yogurt may not be a traditional option in a Russian Salad, but who's gonna stop me? That's what I thought. Preheat oven to 400F. Place salmon on some aluminum foil and season with salt and pepper. Bake until desired level of doneness. (I follow the "8 minutes per inch of thickness" rule myself.) In a large saucepan, bring 1 quart of salted water to a boil. As the water is heating up, finely chop the vegetables. Nothing should be larger than a 1/4 " dice. Mix all the vegetables, except the potatoes, in a large bowl. When the water is at a boil, add the potatoes to the saucepan. Let the water return to a boil and then turn off the stove and cover. Let this sit for 5 minutes. While the potatoes are cooking, flake the salmon into the bowl with the other vegetables. Drain the potatoes and rinse lightly with cold water. Add to the other vegetables. Stir in herbs, lemon zest, lemon juice, and yogurt. Season to taste with salt and pepper. Serve with some crusty bread. If you haven't figured it out (not that I' making it easy for you), you'll just have to wait and see. Waiting really is the hardest part.